The dilemma: you love cats and you want to welcome a furry feline into your life, but you get itchy and sneezy when you’re around them. You may have heard about hypoallergenic dog breeds, but does the same exist with cats? First, the bad news: just like with dogs, no cat breed is 100% hypoallergenic, but the good news is that there are several breeds that won’t disturb your allergies nearly as much as the average cat. It’s estimated that about 10% of Americans are allergic to cats. Though cat hair may seem like the culprit, it isn’t the only issue. Most cat allergies are caused by a protein known as Fel d 1, which is present in a cat’s saliva, fur, dander and urine. When a cat grooms itself, this sticky protein is transferred onto the coat which gets dispersed throughout the home when a cat sheds. According to Dr. Karen Becker, male cats tend to produce more of the Fel d 1 protein, especially if they aren’t neutered. Though there aren’t any allergy-free cats, there are some cat breeds that produce fewer allergens. This hairless breed doesn’t have a coat to shed which means there won't be any allergy-carrying cat hair floating through the air. However, this loving, cuddly breed does require regular grooming, including frequent baths and ear cleaning. Most cats have three layers of fur: a bottom coat (down hairs), a middle layer (awn hairs) and a top layer (guard hairs). 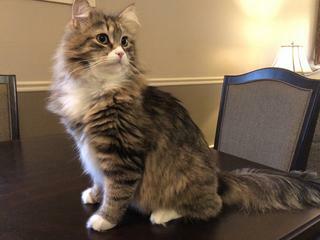 This intelligent, active cat breed only has the bottom coat, meaning they have less hair than cats with three layers, therefore less shedding. 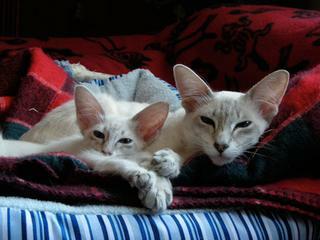 The Devon Rex also has only the soft bottom coat of hair, and like the Cornish Rex, they shed less than other cat breeds. They are a uniquely social breed with dog-like qualities and don’t require much grooming. 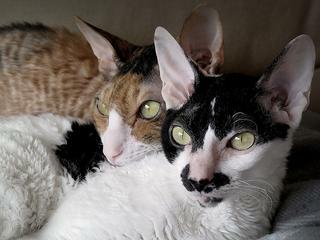 Similarly, the intelligent and social Javanese cat only has one layer of fur, but it is the top layer. Weekly combing and infrequent bathing are enough to care for their fine, silky fur. This exotic looking cat is highly active and talkative. They have short, fine fur that needs only infrequent bathing. Because they shed less and groom themselves less than other cat breeds, they will produce fewer allergens. 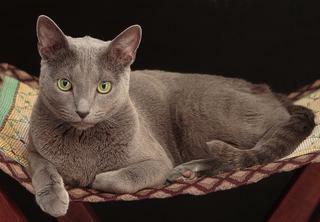 Russian Blue cats naturally produce less of the Fel d 1 protein, which is the most common allergen produced by cats, making them a good choice for those with cat allergies. This loyal breed enjoys attention and affection and his coat needs weekly brushing. 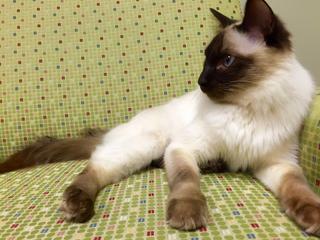 Often referred to as the long-haired Siamese, this breed also produces less of the Fel d 1 protein. The Balinese is agile and enjoys being around people. Caring for his coat is as easy as weekly combing. This is another cat breed that produces lower levels of the Fel d 1 protein. This affectionate, calm kitty has a long triple coat that needs regular brushing to prevent tangles and mats. Because even the low-allergy cat breeds produce allergens, those who are allergic to cats may still experience symptoms. However, there are a number of measures you can take to keep cat allergens to a minimum. Bathe your cat regularly with cat-friendly shampoo. Keep your bedroom cat-free to minimize allergy symptoms while you sleep. Wash your hands after petting or handling your cat. Feed your cat a high-quality diet to reduce shedding. Clean your home thoroughly and regularly, especially areas that collect cat hair. Reduce the number of surfaces on which allergens can accumulate. For example, swap out curtains for non-fabric window covers, and opt for non-upholstered furniture and hard flooring.